I like entertaining and brunch is favorite meal of mine, both to make and to eat. 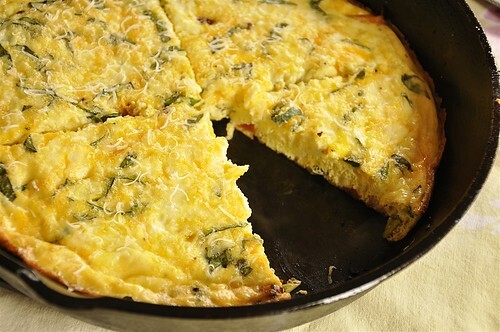 One of the easiest menus I use is to center the meal around a large seasonal frittata, such as an herb, cheese and vegetable recipe. Once I’ve decided on the frittata, I surround that savory dish with a fruit salad, potatoes, breads and/or danish. Sometimes I add additional protein on the side like smoked salmon, sausages and/or bacon. Frittatas are basically an Italian version of the omelette, but they are served open-faced and not folded over – though some frittata recipes do remind me more of a quiche than an omlette, but without the crust. Otherwise, frittatas are pretty versatile and easy to make, just decide on the filling, vegetables, meat and/or cheese, stir in well-beaten-eggs, then finish off in the oven. Nothing could easier, as such you’ll find that there hundreds of recipes and a handful of techniques, for instance partially cooking the frittata on the stove top and then finishing off in the oven. Frittatas should be very thick and made with just about any ingredient you have on hand. I’ve seen recipes that add sour cream and/or milk to help add body and volume to the eggs, while others swear all that is needed for height are well beaten eggs with lots of air in them, I’ve eaten and enjoyed them all ways. Frittatas make a great meal anytime; not only for breakfast/brunch but also for lunch and dinner as well. Try one with a salad, some olives and crusty bread on the side—deliziosa.